Rodrigo Duterte cursed at the Cotabato Governor because of the rice donations they gave to the farmers! Home / News / Rodrigo Duterte cursed at the Cotabato Governor because of the rice donations they gave to the farmers! The Davao City Mayor Rodrigo Duterte has once again attacked the people who tries to say something bad about him. Duterte wasn't able to control his emotions towards the Cotabato Governor Emmylou 'Lala' Mendoza. This issue is about the farmers in Kidapawan that are begging for rice. In a forum, Duterte fires back at Mendoza, the one who got offended after the politicians donated rice to the farmers and even stated that it was just a public stunt. We can still recall that the farmers in Cotabato had a protest at the national highway of Kidapawan to ask for rice, but instead, they received bullets! After what happened, Mayor Duterte and the city government of Davao sent hundreds of sacks of rice to the farmers! He also stated that he wasn't able to personally give it because he is in Manila that time. He denied that it is just a form of a public stunt and even stated that he's not like what they're thinking. 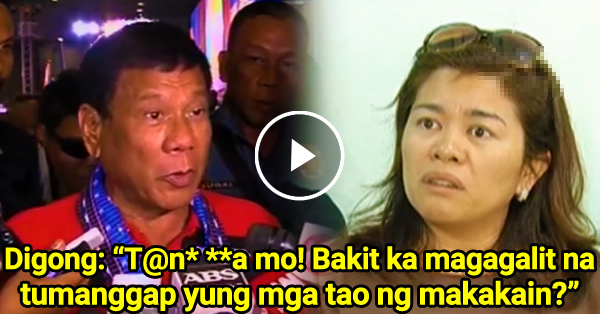 Duterte wasn't able to hold back his anger which resulted to him, cursing at the Cotabato governor!